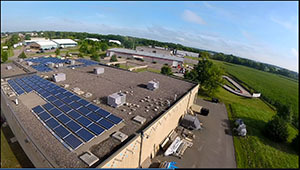 Environmental Commitment - Unity Tool Inc.
From solar panels to recycling, Unity Precision Manufacturing is conscientious of how the environment is impacted by the company’s operations. Not only is this commitment a part of our sense of environmental responsibility, it gives us a competitive edge in the global marketplace. In 2017, Unity was named one of the lucky winners of the Made in Minnesota Solar Incentive Program. We also participated in the Xcel Energy Solar Rewards program. Both programs provided Unity with grants which allowed us to install a 60 kilowatt solar panel system at our facility. We are proud — and also think it’s pretty cool — to be able to use this technology and rely primarily on our own energy source to run our business. As a result of our efforts, we are working towards becoming Energy Star Certified. We’ve been keeping track of the energy produced by the solar panels since their installation in September 2017. At full capacity, they generate 66% of the power needed! In addition, if our panels produce more energy than we use, it will go back into the grid. The system is projected to pay for itself. Over 850 bulbs, all of the lighting at Unity’s facility, were recently upgraded to the more energy-efficient LED bulbs. This transition will save Unity about $2,500 annually and will also have completely paid for itself within seven years. Unity recycles an average of $568 per month in cardboard and scrap metal materials.